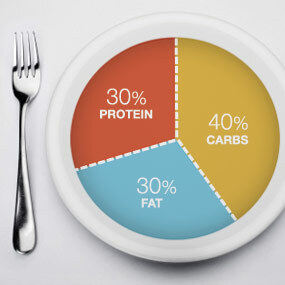 The goal of the 40-30-30 diet plan is to achieve proper balance between two primary metabolic hormones; insulin and glucagon. Insulin is the hormones that encourages the body to store excess calories as fat and glucagon is responsible for seeing that fat is burned off. Hormonal balance is the key to health maintenance and restoration. Since food elicits hormonal responses that are either beneficial or detrimental, it is advisable to cultivate the habit of conscientious eating. This type of eating is balanced. It does not require you to cut carbs, grains, dairy or meat like some of the past diet crazes. This “lifestyle shift”, this is no stranger to athletes either, in fact, it is the favored formula for athletes. This 40-30-30 formula that balanced hormones is favored by not only athletes, but by those wanting to lose weight and people experiencing illness. Bottom line is we need to be aware of the effect our food choices will have not only on our overall healthy but also on our physical performance and our mental and emotional states. These numbers are what you need to do to retain your present weight. If you are looking to lose weight, you need to take in 100-200 fewer calories than the number listed above. If you don’t begin losing weight after two to three weeks, drop another 100 calories. This is a great formula for your body as it will have a wider range of food to grab its essential nutrients from than diets that eliminate food groups. You will also enjoy plenty of energy to support a proper exercise program so you can put some effort into it to make the changes you need to your metabolism so you can eventually have a strong, lean, fit healthy body. Isn’t it time you threw away all your old beliefs and definitions of dieting? “Rebound Free Weight Loss” provides you with all the tools you need to win the weight loss war forever. Discover why your mindset and your body must be healthy first.